How much is being wasted on your shop floor? What can you do about the threat of Waste? There is enough empirical data available which tells us that companies regularly lose at least 10-30 % of their top line to various forms of WASTE. Thru this mini series we are attempting to shed light of various kinds of waste that you carry in your organisation. If businesses have to survive and grow then the WAR on WASTE has to be fought daily and won. Let’s start by understanding the basic of waste in context to manufacturing. The simplest way to describe waste is as “Something that adds no Value.” Our customers would not be happy to pay for any action that we take that does not add value to what they actually want and nor should we be. Would you be happy if you received a bill in a restaurant that included a meal that was prepared in error? No; you would argue and demand that it was removed from your bill; yet if you buy a product in a store the price that you pay will contain costs that you would not want to pay. Would you want to pay for the machine operators wages whilst they sat idle waiting for a delivery, or for the rework processes that had to be undertaken because the machine was incorrectly set, or even for storing your product for three months before it was delivered to the store? These wastes are included within the cost of your products, either inflating the price you pay or reducing the profit of the company. Your companies Profit is your selling price less your costs, no matter how you think about the selling price it is very much dictated by the market not by yourself. If you charge too much then your customers will go elsewhere, even if you charge too little you may lose customers as they will perceive there may be something wrong with what you are offering. Therefore the only way you have to improve your profits are to reduce your costs; this means removing all elements of waste from your processes. In addition to improving your profits you will find that waste has a major impact on your customer’s satisfaction with your products and services. Your customers want on time delivery, perfect quality and at the right price. 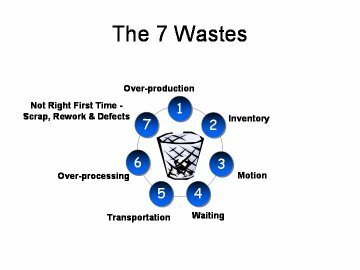 Something that you cannot achieve if you allow the 7 wastes to persist within your processes.